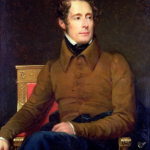 Alphonse de Lamartine was a French writer, poet and politician who was instrumental in the foundation of the Second Republic and the continuation of the Tricolore as the flag of France. "Experience is the only prophecy of wise men." "Limited in his nature, infinite in his desire, man is a fallen god who remembers heaven."